"…it’s worth hearing de los Angeles in pristine voice. She is perhaps too genteel for the role, but she pours out her tangy voice unstintingly and shapes the words of her native language with unsurpassable flavor and clarity. 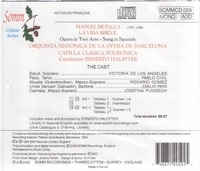 Halffter is an intense, authoritative conductor…." "de los Angeles’ voice is purer and more youthful [than in the 1965 remake], portraying a correspondingly greater vulnerability in her relationship with the man she worships. Her solos are sung with the utmost beauty and clarity, and she’s incomparably affecting in her second solo as she realises Paco’s treachery."